We tried the dehydrated beef tendons and the freeze dried green tripe entree, both things that Ruby and Boca already love. 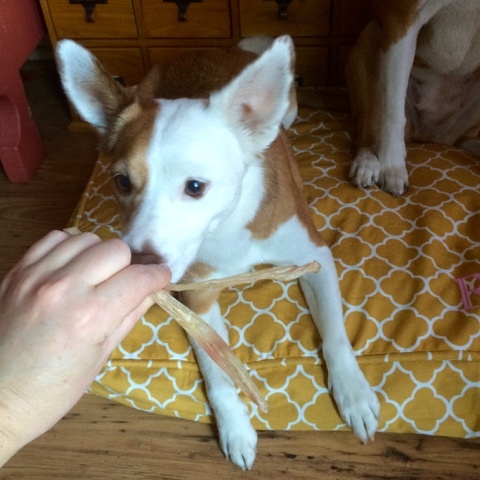 Beef tendons are one of my favorite chews to offer; they are not as stinky as bully sticks and will generally keep them busy for ten to twenty minutes, depending on the size of the chew. Tripe is another of my favorite things to feed my dogs. Not only do the dogs find its pungent smell particularly attractive, but it has some great benefits. I feed canned and freeze dried tripe, the latter being much less offensive in an olfactory sense. I always top The Ginger Sisters' kibble meal (every other night) with freeze dried protein, and the Raw Paws tripe entree is perfect for this. 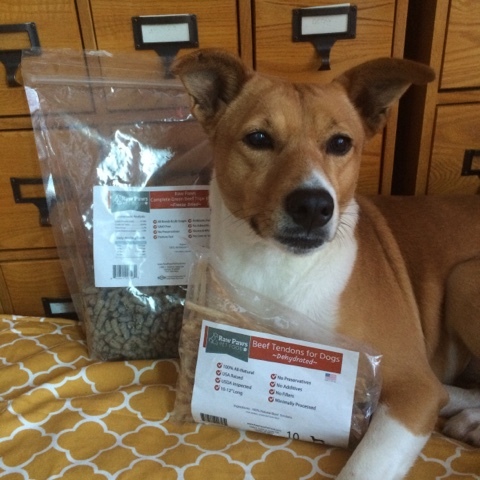 Raw Paws is giving one of our lucky readers a chance to win a package of dehydrated beef tendon chews. The giveaway is open to U.S. residents only and the winner must respond to the notification email within 72 hours. 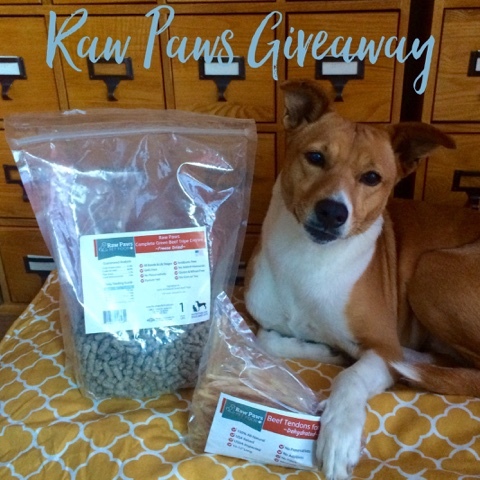 Disclaimer: Raw Paws Pet Food provided the giveaway prize and sample product in exchange for spreading the word about their company. 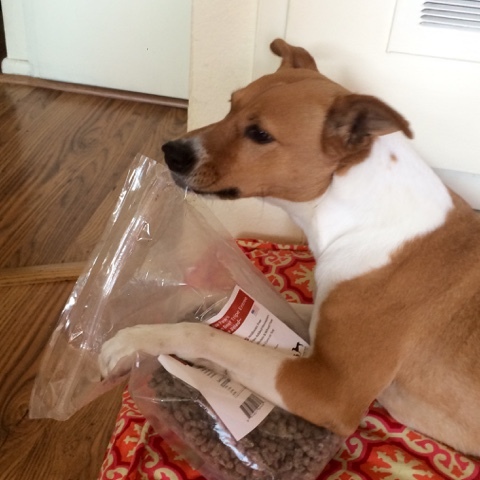 Raw Paws Pet Food is not responsible for the content of this post. All opinions expressed are my own and I only publish reviews for products I feel comfortable using in the day to day life of my pets. Great review! Zoe and Phoenix really liked the chews they got from Raw Paws, too! Sounds like goodies my dogs would like. He has not, but I know he would LOVE them. Thank you for the wonderful giveaway. I think my Mollie would love these! Fab review! The dogs absolutely love beef tendons. They're a favorite around here. Sounds good, we have not tried tripe yet! My dogs haven't tried beef tendons or green tripe - yet. Mike likes beef tendons but he has never had the tripe. No they have not tried the tendons or green tripe. My pup hasn't, but I know that she would love them. Not yet but they look great! I order the tendon chews a lot. Our dogs love them and they don't smell as strongly as bully sticks. Love dehydrated green tripe. It's a great meal topper. Like so many things, I learned about tripe from you! The lady at one of the holistic pet stores I shop at recommended the tendons and we never looked back - they are definitely my favorite chew, followed by THK Beams. My dogs love bully sticks but these sound like a great alternative. Wyn and Khloee take a while to chew things but McKenzie Rae will devour any type of chew I give her. They haven't tried tripe but I'm sure they'd love it. I almost never feed bully sticks any more, they are so stinky and the tendons worry me a little less as far as the dogs swallowing too large of pieces. I am so interested in feeding raw, but overwhelmed. This sounds like a great option - thanks for th review ! I understand, Danielle! I supplement some raw food but am not interested in feeding exclusively raw for several reasons. My girls get frozen commercial raw every other evening, which keeps it affordable. My dogs have never tried these and I bet they would love them! Nala has tried both beef tendons and green tripe and loves them both. Cody has not tried either because he is unsure about treats but one day he will catch on that treats are delicious. No he has had beef tendons or tripe before but I think he would love it. My Tuc has not tried either but he has tried most everything in my house especially shoes and he has yet to find something that he doesn't like. My dogs haven't had either, but I'm sure they would love both. They love their treats! Sarge has not ever tried beef tendons or green tripe yet. This would be great to try. Thanks for the chance.